They’re here, they’re finally here! The drives that we have been waiting for, for what seems like so long. At least we at the SSD review have been waiting so long for. But, what drives are they you might ask? Today, we have in our hands two tiny M.2 SSDs that could have just what it takes to challenge the Samsung 960 series for best in class value and performance. 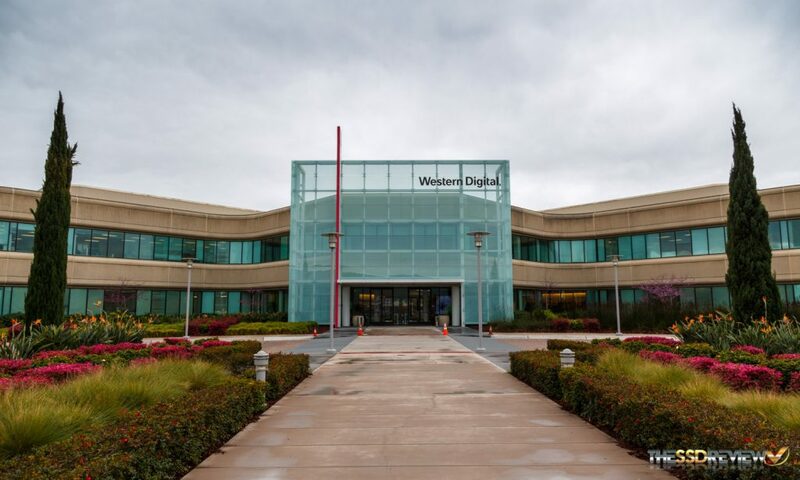 These drives are such a big deal that we were even flown to WD’s facilities in Milpitas, California to get the low down on what really went into the development of these products. What are these drives? None other than the brand new WD Black and SanDisk Extreme PRO NVMe SSDs. Yes, it’s been a long time coming, especially for the new SanDisk Extreme Pro, and we can’t wait to tear up the benchmarks with these bad boys. But, before we get on with our analysis, we want to clarify something about them. Just like the WD Blue 3D and SanDisk Ultra 3D, these are both the same drives; the only tangible difference is the sticker. WD and SanDisk are both very strong brands in two parts of the market. SanDisk is very close with the media creative pros such as videographers and photographers, while we would wager that anyone who has built a PC, ever, or anyone who games, has had a WD HDD at one point or another. In light of this, each brand doesn’t want to give up what they have worked so hard for. It has taken years and years of hard work and cost billions and billions of dollars for WD and SanDisk to get to where they are today. We can’t blame them for that. Both SSDs will feature nearly the same value-adding software, but both brand products will come in different capacity points, better suiting their market base. WD is going to ship a 250GB model that SanDisk is opting to pass on, at least at this time. WD sees how many system builders use their drives and understand that their customers will want a lower capacity model to keep overall upfront system cost down. 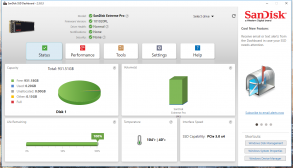 SanDisk, on the other hand, knows that their customers choose their products mainly for upgrading their systems. Thus, after doing their market research, SanDisk has decided that a 250GB model just does not suit their customers…after all, if you really have a professional media workflow, especially nowadays with all these large RAW files and 4K and upcoming 8K video cameras, 250GB in the grand scheme of things is quite tiny. So, WD is going to keep catering to their customers while SanDisk will continue to do the same for theirs, albeit slightly different marketing strategies even though both are under the same company. With that said, let’s get on with the review and get into their specifications, what features they have, what makes these drives tick, and why you need one. 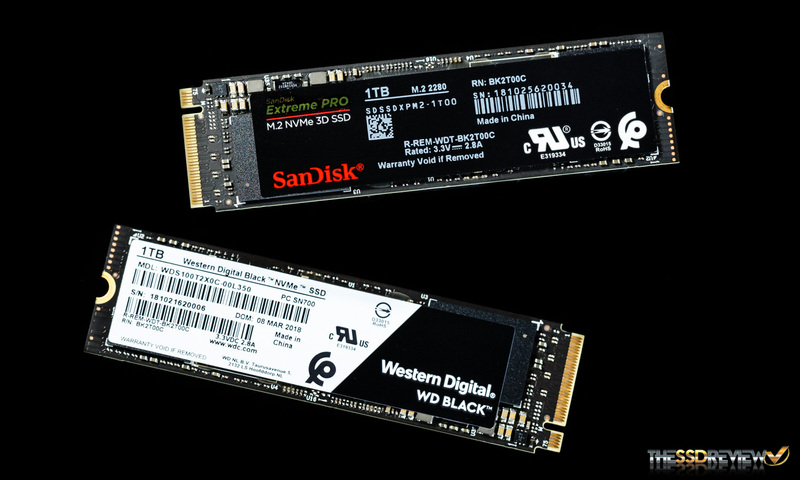 The WD Black NVMe and the SanDisk Extreme Pro are both M.2 form factor PCIe 3.0 x4 NVMe devices. The WD will be available in capacities of 250GB – 1TB while the SanDisk will only be available in 500GB and 1TB. Pricing for each is as follows: 250GB ($129.99), 500GB ($229.99), and 1TB ($449.99). 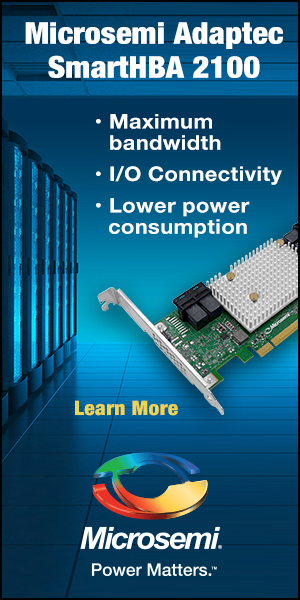 They are rated for sequential read speeds of up to 3.4GB/s and sequential write is rated for up to 2.8GB/s. The write speed is based on their SLC cache performance, however. Once that fills, their write performance will degrade a bit. The 1TB models were are testing today will drop to 1.4GB/s…which alone is still freaking fast and outshines the 1TB Samsung 960 EVO. Additionally, the random read and write performance are rated for up to 500K/400K IOPS, respectively. Furthermore, their endurance ratings match the Samsung 960 Pro with the 1TB model being rated at 600TBW and the smaller capacities halving that as you go down. Unlike the previous SATA based SanDisk Extreme PRO, these new NVMe M.2 drives don’t come with a unicorn like 10yr warranty, instead, we will have to accept a 5yr warranty. Sadly, NAND just isn’t anywhere near as durable as DRAM and we don’t see products coming with lifetime warranties anytime soon. Now, let’s get into the features. 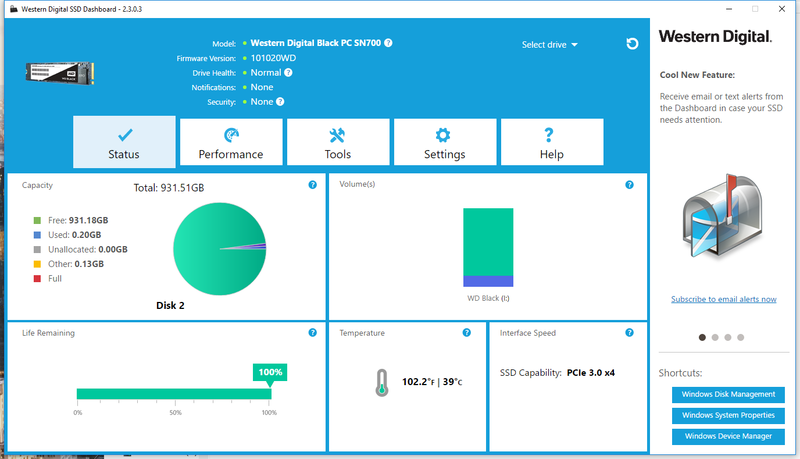 These SSDs meet NVM Express version 1.3 compliance, features TRIM, and support S.M.A.R.T. 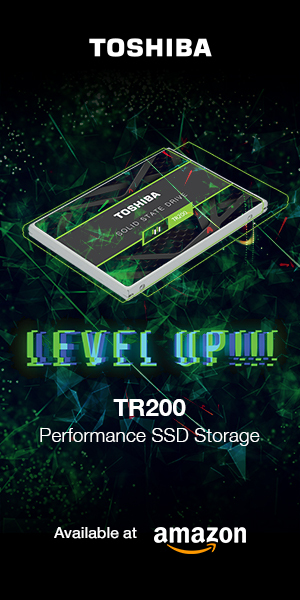 For the NAND flash itself, these SSDs feature defect and error management, dynamic and static wear-leveling, bad block management, background garbage collection, error correction layers, and thermal throttling support. Of course, there is an SLC write cache that is tiered and both products have a very similar SSD toolbox, as can be seen in the screenshots above. 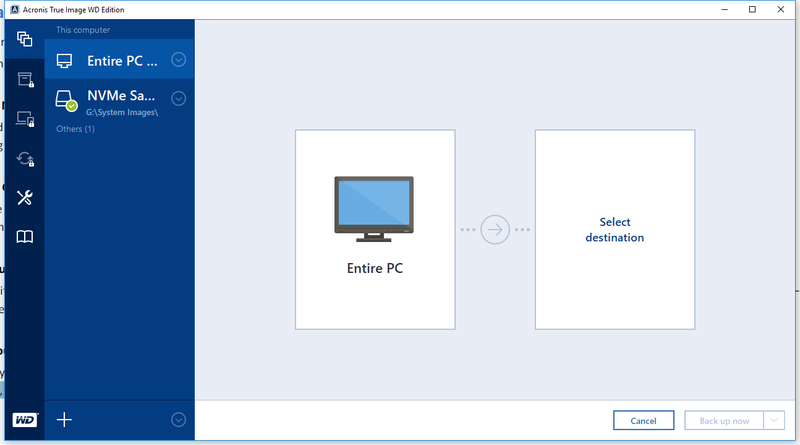 Additionally, Acronis True Image WD Edition software is available as a free download. 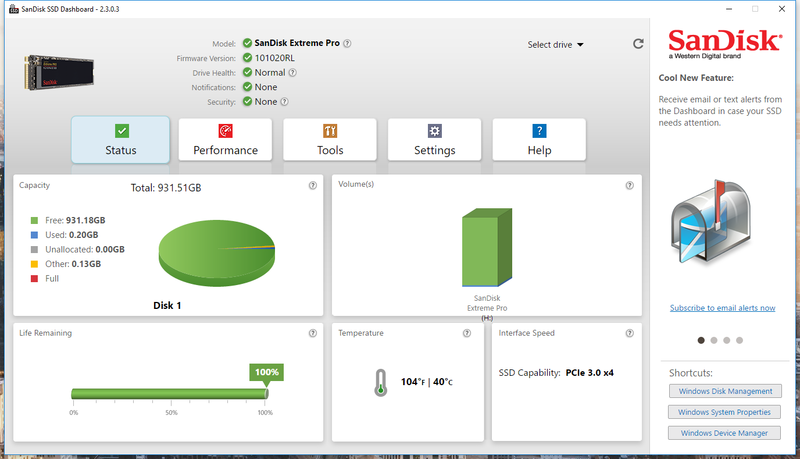 You can use it to easily clone drives and back up your operating system, applications, settings, and all of your data.